Here at Garvin’s Sewer Service, we are full-service plumbing contractors. As our name suggests, we can tackle your sewer cleaning needs with ease, because we have the equipment and the knowhow to tackle any clog you send our way. But what about plumbing service? Sure, we handle the water going out, but what about all that water coming in? We’re happy to say that Garvin’s is there for you no matter what plumbing problems you’re having, and that doesn’t just mean when you’re having trouble. Here are three ways that Garvin’s can be involved with your home or business. If you’re having a new home built, Garvin’s can ensure that all your pipes are properly installed. We say “properly” because it’s so incredibly important to make sure that absolutely every pipe is installed at the right angle, every gasket is secured properly, and ever joint is tight. If pipes aren’t properly installed, it can cause problems that show up weeks, months, or years later, well after the pipes are sealed in behind drywall and under flooring. Don’t take the risk of hiring a subpar plumber to take care of your plumbing services; give Garvin’s a call and know that you’ll be getting the best the first time. Remodels can be tricky, and they often have to be done quickly. Unlike new construction, there’s often someone watching over your shoulder, wondering when you’re going to be done. “Quick, get the pipes in so that we can install the cabinets.” “Faster, we have to put in the countertop!” We completely understand that you have other contractors who are waiting on us during a remodel, so we will make sure to move quickly and efficiently. We’ll also make sure your old piping gets properly disposed of, considering sewer pipes are a bio-hazard. 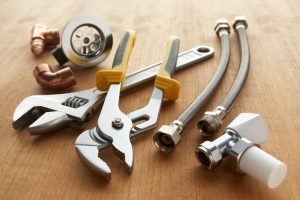 Of course, Garvin’s is there for all of your plumbing repair needs. Basic plumbing services run the gamut from a simple garbage disposal fix to discovering why your water bill doubled last month. We can fix your incoming plumbing (white water) and your outgoing plumbing (black water). If you’re not getting the water pressure you need, it could be a problem with leaky pipes on your end. If you’ve got a clog, we can help determine if it’s in your pipes or if it’s the city’s problem. When you’re up to your ankles in water, Garvin’s can help you whether it’s fresh water or sewer water. (Either way, get your ankles out of the water before it rises to electrical outlet levels!) No matter the time of day, no matter the day of the week, no matter what holiday it is, we’re not going to charge you extra in your time of need. We’ll be your emergency plumber to get you stop the water and get it running properly again. As you can see, Garvin’s is there for you with the sewer and plumbing service that will keep your home running for years to come. When you’re looking for the best, give us a call! 3 Ways To Prepare For A Flooded Basement You Know Who To Call For Plumbing Service. But Do You Know Who To Avoid?